"Old Kingdom" redirects here. For other uses, see Old Kingdom (disambiguation). During the Old Kingdom of Egypt ( circa 2686 BC – circa 2181 BC), Egypt consisted of the Nile River region south to Elephantine, as well as Sinai and the oases in the western desert. In ancient Egyptian history, the Old Kingdom is the period spanning c. 2686–2181 BC. It is also known as the "Age of the Pyramids" or the "Age of the Pyramid Builders", as it encompasses the reigns of the great pyramid builders of the Fourth Dynasty—King Sneferu perfected the art of pyramid-building and the pyramids of Giza were constructed under the kings Khufu, Khafre and Menkaure. Egypt attained its first sustained peak of civilization—the first of three so-called "Kingdom" periods (followed by the Middle Kingdom and New Kingdom) which mark the high points of civilization in the lower Nile Valley. The term itself was coined by 18th-century historians[who? ], and the distinction between the Early Dynastic Period and Old Kingdom is not one which would have been recognized by Ancient Egyptians. Not only was the last king of the Early Dynastic Period related to the first two kings of the Old Kingdom, but the "capital"—the royal residence—remained at Ineb-Hedg, the Ancient Egyptian name for Memphis. The basic justification for a separation between the two periods is the revolutionary change in architecture accompanied by the effects on Egyptian society and economy of large-scale building projects. The Old Kingdom is most commonly regarded as the period from the Third Dynasty through the Sixth Dynasty (2686–2181 BC). 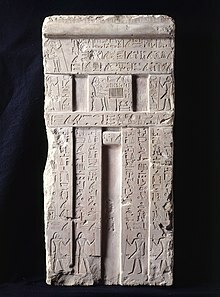 Information from the Fourth through Sixth Dynasties of Egypt is scarce, and historians regard the history of the era as literally "written in stone" and largely architectural in that it is through the monuments and their inscriptions that scholars have been able to construct a history. Egyptologists also include the Memphite Seventh and Eighth Dynasties in the Old Kingdom as a continuation of the administration centralized at Memphis. While the Old Kingdom was a period of internal security and prosperity, it was followed by a period of disunity and relative cultural decline referred to by Egyptologists as the First Intermediate Period. During the Old Kingdom, the king of Egypt (not called the Pharaoh until the New Kingdom) became a living god who ruled absolutely and could demand the services and wealth of his subjects. 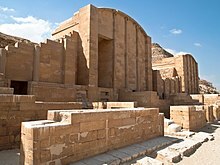 Under King Djoser, the first king of the Third Dynasty of the Old Kingdom, the royal capital of Egypt was moved to Memphis, where Djoser established his court. 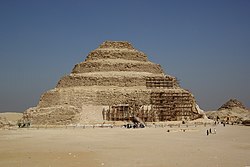 A new era of building was initiated at Saqqara under his reign. King Djoser's architect, Imhotep, is credited with the development of building with stone and with the conception of the new architectural form—the step pyramid. The Old Kingdom is perhaps best known for the large number of pyramids constructed at this time as burial places for Egypt's kings. The Pyramid of Djoser at Saqqara. The first King of the Old Kingdom was Djoser (sometime between 2691 and 2625 BC) of the Third Dynasty, who ordered the construction of a pyramid (the Step Pyramid) in Memphis' necropolis, Saqqara. 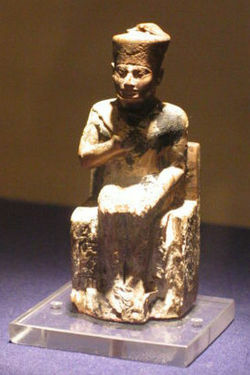 An important person during the reign of Djoser was his vizier, Imhotep. It was in this era that formerly independent ancient Egyptian states became known as nomes, under the rule of the king. The former rulers were forced to assume the role of governors or otherwise work in tax collection. Egyptians in this era worshiped their Pharaoh as a god, believing that he ensured the annual flooding of the Nile that was necessary for their crops. Egyptian views on the nature of time during this period held that the universe worked in cycles, and the Pharaoh on earth worked to ensure the stability of those cycles. They also perceived themselves as a specially selected people. The Old Kingdom and its royal power reached a zenith under the Fourth Dynasty (2613–2494 BC), which began with Sneferu (2613–2589 BC). After Djoser, Pharaoh Snefru was the next great pyramid builder. Snefru commissioned the building of not one, but three pyramids. The first is called the Meidum pyramid, named for its location in Egypt. Snefru abandoned it after the outside casing fell off of the pyramid. The Meidum pyramid was the first to have an above-ground burial chamber. Using more stones than any other Pharaoh, he built the three pyramids: a now collapsed pyramid in Meidum, the Bent Pyramid at Dahshur, and the Red Pyramid, at North Dahshur. However, the full development of the pyramid style of building was reached not at Saqqara, but during the building of 'The Great Pyramids' at Giza. Sneferu was succeeded by his son, Khufu (2589–2566 BC), who built the Great Pyramid of Giza. After Khufu's death, his sons Djedefra (2566–2558 BC) and Khafra (2558–2532 BC) may have quarrelled. The latter built the second pyramid and (in traditional thinking) the Sphinx in Giza. 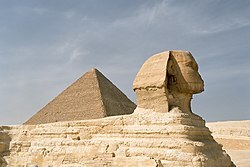 Recent reexamination of evidence has led Egyptologist Vassil Dobrev to propose that the Sphinx had been built by Djedefra as a monument to his father Khufu. Alternatively, the Sphinx has been proposed to be the work of Khafra and Khufu himself. There were military expeditions into Canaan and Nubia, with Egyptian influence reaching up the Nile into what is today the Sudan. The later kings of the Fourth Dynasty were king Menkaure (2532–2504 BC), who built the smallest pyramid in Giza, Shepseskaf (2504–2498 BC) and, perhaps, Djedefptah (2498–2496 BC). The Fifth Dynasty (2494–2345 BC) began with Userkaf (2494–2487 BC) and was marked by the growing importance of the cult of sun god Ra. Consequently, fewer efforts were devoted to the construction of pyramid complexes than during the Fourth Dynasty and more to the construction of sun temples in Abusir. 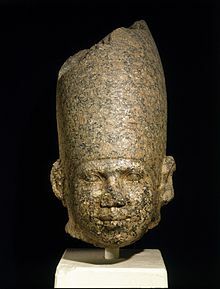 Userkaf was succeeded by his son Sahure (2487–2475 BC) who commanded an expedition to Punt. Sahure was in turn succeeded by Neferirkare Kakai (2475–2455 BC) who was Sahure's son. Neferirkare introduced the prenomen in the royal titulary. He was followed by two short-lived kings, his son Neferefre (2455–2453 BC) and Shepseskare, the latter of uncertain parentage. Shepseskare may have been deposed by Neferefre's brother Nyuserre Ini (2445–2421 BC), a long lived pharaoh who built extensively in Abusir and restarted royal activity in Giza. The last Pharaohs of the dynasty were Menkauhor Kaiu (2421–2414 BC), Djedkare Isesi (2414–2375 BC) and Unas (2375–2345), the earliest ruler to have the pyramid texts inscribed in his pyramid. Egypt's expanding interests in trade goods such as ebony, incense such as myrrh and frankincense, gold, copper and other useful metals inspired the ancient Egyptians to build suitable ships for navigation of the open sea. They traded with Lebanon for cedar and travelled the length of the Red Sea to the Kingdom of Punt—possibly modern day Somalia—for ebony, ivory and aromatic resins. Ship builders of that era did not use pegs (treenails) or metal fasteners, but relied on rope to keep their ships assembled. Planks and the superstructure were tightly tied and bound together. During the Sixth Dynasty (2345–2181 BC) the power of pharaoh gradually weakened in favor of powerful nomarchs (regional governors). These no longer belonged to the royal family and their charge became hereditary, thus creating local dynasties largely independent from the central authority of the Pharaoh. However, Nile flood control was still the subject of very large works, including especially the canal to Lake Moeris around 2300 BC, which was likely also the source of water to the Giza pyramid complex centuries earlier. Internal disorders set in during the incredibly long reign of Pepi II (2278–2184 BC) towards the end of the dynasty. His death, certainly well past that of his intended heirs, might have created succession struggles. The country slipped into civil wars mere decades after the close of Pepi II's reign. The final blow was the 22nd century BC drought in the region that resulted in a drastic drop in precipitation. For at least some years between 2200 and 2150 BC, this prevented the normal flooding of the Nile. Whatever its cause, the collapse of the Old Kingdom was followed by decades of famine and strife. An important inscription on the tomb of Ankhtifi, a nomarch during the early First Intermediate Period, describes the pitiful state of the country when famine stalked the land. The most defining feature of ancient Egyptian art is its function, as that was the entire purpose of creation. Art was not made for enjoyment in the strictest sense, but rather served a role of some kind in Egyptian religion and ideology. This fact manifests itself in the artistic style, even as it evolved over the dynasties. The three primary principles of that style, frontality, composite composition, and hierarchy scale, illustrates this quite well. These characteristics, initiated in the Early Dynastic Period and solidified during the Old Kingdom, persisted with some adaptability throughout the entirety of ancient Egyptian history as the foundation of its art. Frontality, the first principle, indicates that art was viewed directly from the front. One was meant to approach a piece as they would a living individual, for it was meant to be a place of manifestation. The act of interaction would bring forth the divine entity represented in the art. It was therefore imperative that whomever was represented be as identifiable as possible. The guide lines developed in the Old Kingdom and the later grid system developed in the Middle Kingdom ensured that art was axial, symmetrical, proportional, and most importantly reproducible and therefore recognizable. Composite composition, the second principle, also contributes to the goal of identification. Multiple perspective were used in order to ensure that the onlooker could determine precisely what they saw. Though Egyptian art almost always includes descriptive text, literacy rates were not high, so the art gave another method for communicating the same information. One of the best examples of composite composition is the human form. In most two-dimensional relief, the head, legs, and feet are seen in profile, while the torso faces directly front. Another common example is an aerial view of a building or location. The third principle, hierarchy of scale, illustrates relative importance in society. The larger the figure, the more important the individual. The king is usually the largest, aside from deities. Similarity in size equated similarity in position. However, this is not to say that physical differences weren't shown as well. Women, for example, are usually shown as smaller than men. Children retain adult features and proportions, but are substantially smaller in size. Aside from the three primary conventions, there are several characteristics that can help date a piece to a particular time frame. Proportions of the human figure are one of the most distinctive, as they vary between kingdoms. Old Kingdom male figures have characteristically broad shoulders and a long torso, with obvious musculature. On the other hand, females are narrower in the shoulders and waist, with longer legs and a shorter torso. However, in the Sixth Dynasty, the male figures lose their muscularity and their shoulders narrow. Eye also tend to get much larger. In order to help maintain the consistency of these proportions, the Egyptians used a series of eight guidelines to divide the body. They occurred at the following locations: the top of the head, the hairline, the base of the neck, the underarms, the tip of the elbow or the bottom of the ribcage, the top of the thigh at the bottom of the buttocks, the knee, and the middle of the lower leg. From the soles of the feet to the hairline was also divided into thirds, one-third between the soles and the knee, another third between the knee and the elbow, and the final third from the elbow to the hairline. The broad shoulders that appeared in the Fifth Dynasty constituted roughly that one-third length as well. These proportions not only help with the identification of representations and the reproduction of art, but also tie into the Egyptian ideal of order, which tied into the solar aspect of their religion and the inundations of the Nile. Though the above concepts apply to most, if not all, figures in Egyptian art, there are additional characteristics that applied to the representations of the king. Their appearance was not an exact rendering of the king's visage, though kings are somewhat identifiable through looks alone. Identification could be supplied by inscriptions or context. A huge, more important part of a king's portrayal was about the ideal of the office of kingship, which were dependent on the time period. The Old Kingdom was considered a golden age for Egypt, a grandiose height to which all future kingdoms aspired. As such, the king was portrayed as young vital, with features that agreed with the standards of beauty of the time. The musculature seen in male figures was also applied to kings. A royal rite, the jubilee run which was established during the Old Kingdom, involved the king running around a group of markers that symbolized the geographic borders of Egypt. This was meant to be a demonstration of the king's physical vigor, which determined his capacity to continue his reign. This idea of kingly youth and strength were pervasive in the Old Kingdom and thus shown in the art. Sculpture was a major product of the Old Kingdom. The positioning of the figure in this time was mostly limited to standing, with feet either together or in the striding pose, or sitting. Group statues of the king with either gods or family members, typically his wife and children, were also common. However, it was not just the subject of sculpture that was important, but rather the material as well. The use of hard stone, such as gneiss, graywacke, schist, and granite, was relatively common in the Old Kingdom. In addition, the color of the stone had a great deal of symbolism and was chosen deliberately. Four colors were delineated in ancient Egyptian language: black, green, red, and white. Black was associated with Egypt due to the color of the soil after the Nile flood, green with vegetation and rebirth, red with the sun and its regenerative cycle, and white with purity. 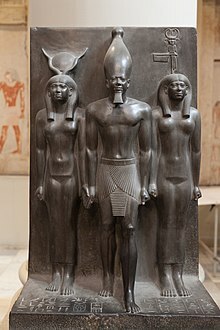 Statue of Menkaure with Hathor and Cynopolis is an example of a typical Old Kingdom sculpture. The three figures display frontality and axiality, while fitting with the proportions of this time period. The graywacke medium comes from the Eastern Desert in Egypt and is therefore associated with rebirth and the rising of the sun in the east. ^ a b "Old Kingdom of Egypt". Ancient History Encyclopedia. Retrieved 2017-12-04. ^ Carl Roebuck, The World of Ancient Times, pp. 55 & 60. ^ a b Carl Roebuck, The World of Ancient Times, p. 56. ^ Bothmer, Bernard (1974). Brief Guide to the Department of Egyptian and Classical Art. Brooklyn, NY: Brooklyn Museum. p. 22. ^ Herlin, Susan J. (2003). "Ancient African Civilizations to ca. 1500: Pharaonic Egypt to Ca. 800 BC". p. 27. Archived from the original on August 23, 2003. Retrieved 23 January 2017. ^ a b "Ancient Egypt - the Archaic Period and Old Kingdom". www.penfield.edu. Retrieved 2017-12-04. ^ Carl Roebuck (1984), The World of Ancient Times, p. 57. ^ p.5, The Collins Encyclopedia of Military History (4th edition, 1993), Dupuy & Dupuy. ^ Jean-Daniel Stanley; et al. (2003). "Nile flow failure at the end of the Old Kingdom, Egypt: Strontium isotopic and petrologic evidence". Geoarchaeology. 18 (3): 395–402. doi:10.1002/gea.10065. ^ a b c d e f g h i j k l Robins, Gay (2008). The Art of Ancient Egypt. Cambridge: Harvard University Press. ^ a b Sourouzian, Hourig (2010). A Companion to Ancient Egypt Volume I. Blackwell Publishing Ltd. pp. 853–881. ^ a b Arnold, Dorothea (1999). When the Pyramids Were Built: Egyptian Art of the Old Kingdom. The Metropolitan Museum of Art and Rizzoli International Publications Inc. pp. 7–17. ^ a b c d e Robins, Gay (1994). Proportion and Style in Ancient Egyptian Art. Austin: University of Texas Press. ^ Malek, Jaromir (1999). Egyptian Art. London: Phaidon Press Limited. ^ "Statue of Menkaure with Hathor and Cynopolis". The Global Egyptian Museum. ^ a b Morgan, Lyvia (2011). "Enlivening the Body: Color and Stone Statues in Old Kingdom Egypt". Notes in the History of Art. 30 (3): 4–11. doi:10.1086/sou.30.3.23208555. ^ Klemm, Dietrich (2001). "The Building Stones of Ancient Egypt: A Gift of its Geology". African Earth Sciences. 33 (3–4): 631–642. CiteSeerX 10.1.1.111.9099. doi:10.1016/S0899-5362(01)00085-9. Kanawati, Naguib. Governmental Reforms In Old Kingdom Egypt. Warminster: Aris & Phillips, 1980. This page is based on the Wikipedia article Old Kingdom of Egypt; it is used under the Creative Commons Attribution-ShareAlike 3.0 Unported License (CC-BY-SA). You may redistribute it, verbatim or modified, providing that you comply with the terms of the CC-BY-SA.